Group piano lessons in London are fun – discover why you should join! Group lessons are a fantastic way to learn how to play the piano. In this article discover the benefits of group piano lessons! Students learning how to play the piano in a group class and having a lot of fun at the same time! In this article, you will discover why group piano lessons is well worth your time. Yes, one-to-one lesson do have some clear advantages, but so do group classes. In a group you develop your ensemble skills, musical ear and you can learn from other people’s playing. So without further ado, here’s why you should seriously consider group piano tuition. Group piano lessons are both fun, educative and super-rewarding! Make sure you join a group piano course with us sooner than later and make your boldest piano dreams come true! Learning to listen to others whilst playing your own piano past is a crucial skill that can be especially useful when playing in an ensemble or group format. During the group classes at the London Piano Institute, I often ask the class to play the major scales (and minors) all at once. Of course one scale at a time, but through all 12 keys. I usually count in the class and then each individual will play the scale over two octaves at the same time. It may seem like an easy exercise, however, each participant has to play the correct sequence of notes in perfect timing to each other. This is a brilliant exercise in ear training! In order to form a harmonious sound and to play in time everyone has to participate. A true exercise in ear training that will help you understand music so much more! In a one-to-one piano lesson there is rarely time for proper music theory education. I have found that due to the nature of group piano lessons, it is so much easier to integrate music theory as well as harmony. Music theory is a crucial part of learning the piano. Remember confidence breeds competence. By understanding the inner workings of music better, you will have a much better understanding of each piano composition you play. You will be more confident and your playing more competent. At the London Piano Institute, we generally allow 2 lessons to be rescheduled on the condition that 72 hours notice have been provided (per quarter). In our group piano classes we have more flexible policy. You can replace any lesson (up to max 3 per quarter) with another group class at a similar level. Alternatively, you can also request an online home-study lesson instead. (where available). Due to the nature of group piano lessons, we are able to provide you with more flexibility. Please remember, at the London Piano Institute, we always try to be as accommodating as possible. We aim to give you the smoothest possible course experience. You get to meet interesting people who shares a common passion – the piano! By learning to play the piano in a group format you get to meet amazing people from literally all walks of life. In our piano group classes we have lawyers, doctors, writers, actors, chefs, personal assistants, art directors, photographers, accountants, students, fellow musicians, investors, traders, business owners, singers and people from all walks of life. It is a wonderful opportunity for you to learn to play the piano and make new friends in London who share a common passion. After your piano lesson, you can even go out to a restaurant and enjoy a great meal together …music is wonderful! Music brings us together and makes the world a much better place! Another great reason for you to join a fun, educative and exciting group piano class! By learning to play the piano in a group format you drastically improve your musical time keeping abilities. The ability to play in time with other musicians is simply indispensable! By studying in a group format, you automatically improve your timing skills. During your weekly group piano lessons, you will have to play scales, arpeggios, compositions with your fellow class mates in time. By having to play exercises in an ensemble (group) format, your timing capabilities improve week upon week. In addition, at the London Piano Institute we work with a metronome. A metronome is a time-keeping device patented in 1815 by Johann Maelzel as a tool for musicians, under the title “instrument /machine for the improvement of all musical performance called Metronome”. You can also discover metronomic advice in following article: How to practice the piano with a metronome. You can download a high-quality metronome app here. Learning how to sight-read properly is one of the most important aspects of becoming a pianist. A good sight-reader enjoys playing the piano so much more! With great sight-reading skills, you can simply pick up a piano composition at will, and play it to a reasonable standard at first glance. During your group piano lessons you will often have to sight-read easy piano compositions in a group format. The reason for this is the fact that you perform and practice together in a group and you cannot stop as you will hold up the entire group. This is the correct method of practicing sight-reading and at the London Piano Institute we take great pride in always helping all our students learn the right habits and techniques from day one! 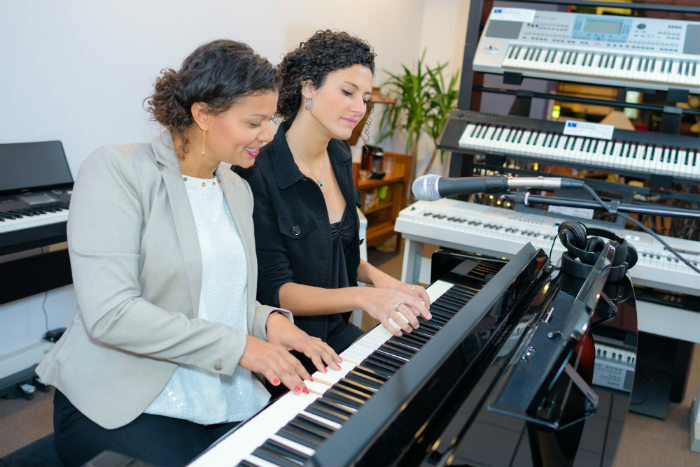 During your group piano lessons at the London Piano Institute, you will be introduced to a wide range of musical styles including classical, jazz and pop. As you will often perform and practice these styles together in a group format, you will develop a very keen musical ear. A solid musical ear will help you with all your future musical development. Whilst learning to play the piano in a group format, you will at times play the bass or lower notes on the piano. At times you will play the mid-range harmony and at times the high-range melody. So in a nutshell, you will be introduced to the entire range of the instrument. This indispensable experience will help you develop a very keen musical ear! You will also play through all the primary musical scales, giving you a solid head start in your piano education and development. You learn how to work in a team! By studying the piano in a group, you will learn the all-essential skills of working properly in a team. In a team, you have to be patient and work with others in an effective and harmonious way. You will learn a lot about teamwork during your weekly group piano lessons. At times, you will be frustrated and impatient during your piano lessons. Perhaps you will struggle to play a certain passage in time with the rest of the group. Once again, this provides you with an opportunity to improve your communication and team skills. Group piano lessons is simply wonderful, helping you with essential skills and to fulfil your musical passion! Playing in front of an audience can be a very daunting experience. Most people do not have a fantastic time when they perform for the first time. This is due to a lack of skill and knowledge of how to perform! In a group setting, you will get numerous opportunities to perform live in front of your fellow class mates. You will practice the art of performing in front of others in a non-judgmental and ‘easy’ setting. By learning to play the piano in a group, you will cultivate lots of patience and perseverance. Developing these virtues are of the utmost importance for your future music development. You will definitely need lots of patience and perseverance when you attempt to learn a more difficult piece at the piano repertoire. That is why cultivating patience and perseverance is absolutely essential for your piano success. How will you develop patience during your weekly group class? When playing scales with your fellow class mates in harmony and time. The fact of the matter is that it takes time and input to become better. The time factor is why patience is so important. By learning in a group, you automatically develop patience and perseverance. If you are serious about learning the piano, then you must cultivate these most-important virtues. With them, you can conquer mountains and make your boldest music dreams come true! Contact Stefan our manager at enrol@londonpianoinstitute.co.uk with subject line: “group piano course”. Stefan will send you full course details. In a nutshell, it is £185 per calendar month for 4 x 60 minutes and there is also a one-time registration fee of £95 payable upon joining. Once you have selected the group class that suits, your class will usually start the following week where possible. The whole process is quite straightforward and the entire enrolment process is taken care of for you. Remember you do not need any prior experience. You are very welcome as a total beginner! Finally we hope to provide you with outstanding piano instruction that will be a life-long gift to you! You can join at anytime during the year – so contact us now.